Do you play dressmaking detective by going “shopping” on the high street and taking spy photos? I have been loathe to. One of the beauties of sewing is not having to go shopping. But it can save a ton of time and disappointment if you try on different styles and fits before sewing. I try to force myself to go into at least one changing room every time I am in a shopping environment. I have learned so much from this. It has helped me to learn where fit is different on my body, than the standard. I look for sewing details and construction ideas as well as fit and suitability of style. I force myself to try on unfamiliar styles and things I have written off as no good for my body type. Don’t worry about the price tag, the more expensive the better. I avoid wasting too much of a sales assistant’s time in a small boutique. This is easier to do in large department stores. I don’t feel guilty, because I buy other things from the store, and sometimes, I find clothes I want too. It helps to take a partner in crime who’ll give you honest opinions. If they can sew, so much the better. No one blinks an eye anymore if you photograph yourself with a phone. They might feel differently if you had a camera, but everyone is taking selfies. We all know changing room mirrors are deceptive ~ a photo helps to see it clearly (and from behind). I’d love to do this with someone else in London, if anyone wants to play with me. I would love to help another sewer discover new styles that suit them! If you don’t know Cos, it’s a wonderful Swedish chain owned by H&M. The clothes are good quality and aimed at a mature, professional. I don’t think their website does them justice. It looks so minimal! I love this dress at Cos. I particularly like the pocket details. Can you see it has interesting topstitching as well as each of the three pockets are a different shape. The cotton was a medium weight, crisp fabric like chino trousers use. The bust dart is about an inch too high on me, which also makes the neckline look too high. I liked it on me but my husband said it looked tent-like so maybe it could use some waist shaping. If I had enough money, I would have bought this one, anyway. I also loved the idea of this dress with it’s contrasting hem panel. The main body of the dress was a cotton/lyrca jersey, while the hem panel was a crisp cotton. The hem panel is shaped. Cos make liberal use of fusible for their jersey hems. Again, the neck is too high on me and it’s a little too tight in the bust. But I could easily recreate this with my raglan sleeve A-line dress hack, which I like the fit of. Is it helpful to others if I show you my detective work? Or is this really self-indulgent? My aim is to bring to your attention some details that could be copied in your own sewing room, give you confidence to try things on, and point out how they might be changed to help with individual fit issues. I hope to do this on other body types. Please let me know what you think. I think this is s great idea. Takes time though , I guess. Yup, but so does making a garment and then finding it isn’t suitable. I love the idea of Dressmaking Detective. Have at it. I don’t do it enough because the thought of a dressing room exhausts me. As you make clear, though, it does help in making one’s sewing time the most productive. Would love to see these ideas posted – especially on a real body. Yeah. I’d like to do more of this. Dressmaking Detective is an awesome title! I thought the label on your shoulder in the first photo was a funky strap. Wish it was. I think you’re right re darts and neckline too. Will the Dressmaking Detective have to try on belts? Okay, the dressmaking detective will try on belts, just to prove how it doesn’t work on this detective’s body. You’ll see. I do this, too! I tried on a style I thought would not look good on me this weekend. I was pleasantly surprised at how it looked. It was because the cut of the neck fit me much better. I would love to shop with you in London, buy I live in Dallas. I’ll let you know if I’m ever in Dallas, and you let me know if you’re in London. I love this! I do this kind of undercover work too, and have learned a lot about what looks and feels right for me- sometimes I surprise myself. Sure wish I could co-shop with you, but alas, I shop in Michigan and Stuttgart, Germany. I live Germany! Lived there as a teem and just got back from a trip there. I love how German women dress. So simple yet so stylish. Wish I had more room in my luggage to but new clothes while I was there. I’m only an hour away from town on the train, and often visit – I’d be happy to meet up for a bit of detective work! Wow, Gill that looks like a neat project you are working on. Do they need more helpers? Westfield is easy for me if you’d like to meet up sometime. Thanks for this post (and all of your others – I just found your blog). I think it’s a great idea to be a detective. I need to shore up my confidence and try more RTW clothes on. I’m sure I’d learn a lot! It really help to play dressmaking detective. 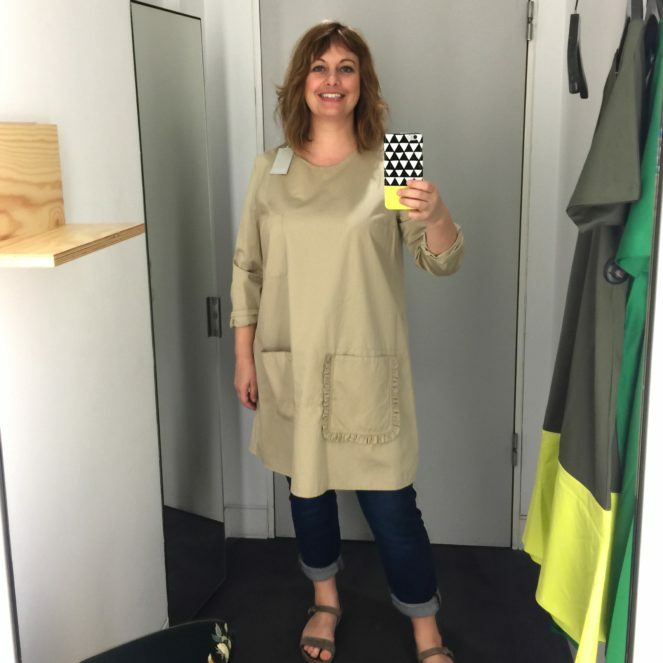 It doesn’t need to be a major commitment, 15 minute in a dressing room while running other errands.